MACON, GA- Macon Mayhem goaltender Charlie Finn recorded a 40-save shutout en route to an 8-0 win over the Evansville Thunderbolts, advancing the Mayhem to the President’s Cup Semi-Finals for the second consecutive season. The Mayhem scored the opening goal for the second consecutive game, as Ian Ecklund tipped in a Brandon Pfeil shot at the 8:45 mark of the first period. Eight minutes later, Dakota Klecha burned the Evansville defenseman and snuck the shot five-hole on the goaltender to give the Mayhem a 2-0 lead heading into the first intermission. Just 1:45 into the second period, Kevin Irwin stayed hot by scoring his fourth goal of the postseason to take a three-goal lead. At the halfway point of the second, Dylan Vander Esch buried a one-timer from a no-look, behind-the-back pass from Daniel Gentzler to take a 4-0 lead. The Mayhem offense exploded for four more goals in the third period to finish off an 8-0 victory to advance to the President’s Cup Semi-Finals. Daniel Gentzler led off the scoring the final period, burying a rebound chance for his first goal of the postseason. Off of a turnover, John Siemer scored his second of the postseason to give the Mayhem a 6-0 lead. Jake Trask and Stathis Soumelidis finished off the scoring to make it 8-0 Mayhem. Charlie Finn started his third game of the postseason and recorded his first career professional shutout, saving all 40 shots he faced in the 8-0 victory. Finn is now 2-1 this postseason with a 1.01 goals against average and .974 save percentage. 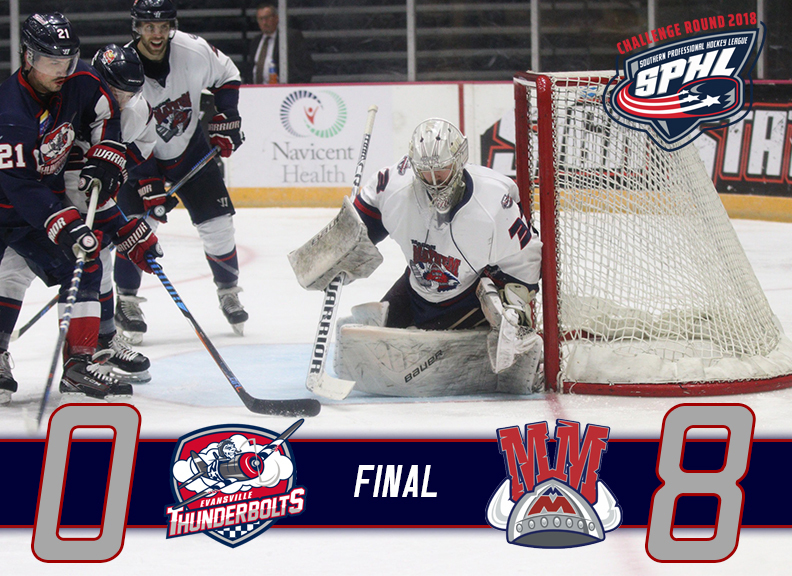 Eight different goal-scorers tallied the eight goals for the Mayhem in game three. Stathis Soumelidis led the team with four points, which is a new career high for points in a single game from Soumelidis. Dylan Vander Esch tallied three points to bring his postseason total to five points in three games. Brandon Pfeil, Jake Trask and Daniel Gentzler collected two points apiece. The eight goals scored by the Mayhem is a new playoff record in the three-year history of the Mayhem. The previous high was six goals in a game, which was recorded on Saturday night against Evansville and in game three of the first round last season, when the Mayhem defeated the Columbus Cottonmouths 6-3. The Mayhem advance to the President’s Cup Semi-Finals. The dates of the games and opponent will be announced on Monday. Single game tickets are on sale through the Macon Coliseum Box Office or at ticketmaster.com. For information on group tickets and ticket plans, visit www.MaconMayhem.com or call the Mayhem Front Office at (478) 803-1592. The Macon Mayhem is a proud member of the Southern Professional Hockey League (SPHL). The team won the President’s Cup Championship last season, bringing the city of Macon their first professional hockey championship ever and the city’s first professional sports championship since 1962. The team is owned by Bob and Diane Kerzner and managed by Director of Hockey Operations, General Manager, and Head Coach Kevin Kerr, a former third-round pick of the Buffalo Sabres. For more information on the Macon Mayhem, visit www.MaconMayhem.com, or follow the team on Twitter (www.twitter.com/MaconMayhem), Instagram (www.instagram.com/maconmayhem), or ‘like’ the Mayhem on Facebook (www.facebook.com/MaconMayhemHockey).